← What can be done to re-introduce representative state Aussie Rules football? The Demise of the White Cedars. The new Adelaide Oval has been a fine development for the City of Churches but there has been an environmental down-side that many will regret. It was the unceremonious removal of 27 slow-growing White Cedar Trees of considerable botanic interest that lined a footpath in front of the Oval, between King William Street and Pennington Terrace. Not a single tree was preserved. This blog highlighted the event three years ago. My ire at the time was not widely shared by a community that was more impressed by the up-grading of the Oval, than a few old trees. However I am pleased to read that not everyone has forgotten the incident, and just maybe some restitution could be made. 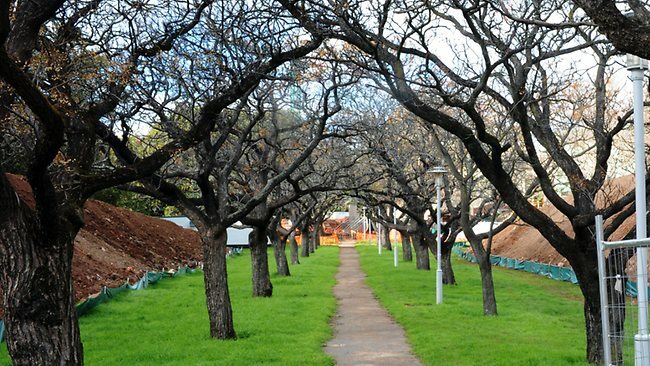 The Adelaide City Council is extremely disappointed at the Government’s swift demolition of the row of White Cedars and footpath in the Northern Park Lands near Adelaide Oval. The White Cedar Avenue and footpath have been a part of the beloved Park Lands for more than 100 years and was widely used by the community to walk or cycle between King William Road and North Adelaide. Council felt very strongly about maintaining the trees and footpath in its existing state, so was disappointed in December 2012 when the Development Assessment Commission (DAC) resolved to support their removal. We accepted DAC’s decision as the independent umpire and our very strong preference now the path and trees are gone is for the construction of a new footpath in the same location and replanting with more trees that are in keeping with the Park Lands. Council looks forward to continuing discussions with the State Government to develop a coordinated and comprehensive plan for the landscape treatment around the Oval that maintains the significance of the Park Lands and existing landscape character. We fully support the Adelaide Oval redevelopment to see it become a world class precinct for all South Australians and visitors to the state. I studied at Adelaide Boys' High School, and the University of Adelaide, Medical School. graduating in 1961. My field of specialisation was Plastic and Reconstructive Surgery. Prior to establishing my practice in Adelaide, I spent 5 years working in India, and Papua-New Guinea, in the field of reconstructive surgery for leprosy. In retirement I joined the Australian Technical Analyst Association and passed the two examinations for a Diploma inTechnical Analysis, and the designation Certified Financial Technician (CFTe) by the International Federation of Technical Analysts. This entry was posted in Adelaide development, The Environment, Uncategorized and tagged White Cedar Trees. Bookmark the permalink. Should Water Diversion be now reconsidered for North Queensland? Time for voters to scrutinize Labor’s economic policies. Complacency, the curse of incumbency!